Your dog is an important part of the life you and your significant other have been building together. So it’s only natural that you’d want to include your beloved pet in wedding day festivities — a celebration that’s meant to be shared with all of your loved ones including the furry kind. While having your dog involved in the ceremony can make the big day even more memorable, it does bring its own challenges. If your heart is set on including your dog, you’ll want to consider these seven important issues. There are plenty of options for including your dog in your wedding, either in a formal role — as ring bearer or flower dog, for example — or as a guest of honor who simply stands (or sits) with the wedding party during the ceremony. Before you give your dog a starring role in the ceremony or reception, look at the day from his or her point of view. Not all dogs have what it takes to be around a crowd of people, especially if many guests are unfamiliar to them. Is your dog friendly, shy or aggressive? Will your pet feel comfortable around guests or in an unfamiliar environment? Shy, nervous or aggressive dogs should be left at home where they will feel safe and secure. Other questions to ask: Does your pooch make a lot of noise? Does he or she tend to jump up or dribble urine when greeting people? At the very least, your dog needs to be well behaved and know basic commands such as “sit,” “stay,” and “off” or “down.” Keep in mind too that even the most social, friendly dog can be overwhelmed (or overexcited) by a crowd of people who shower him or her with attention. Confirm in advance that your wedding venues are pet friendly. When choosing the facilities for your wedding, ask if the venues will allow your dog on the premises. Many churches and some hotels and reception halls have strict “no pets” policies. But there are pet-friendly locations that will be happy to accommodate your four-legged wedding party member. If you can’t bring your pets, you can still include them in the wedding. At the reception, include a photo of your pets on your table number cards, make your wedding favors a tribute to your BFF (best fur-ever friend), create posters that feature your pets welcoming guests to the party or consider a custom cake topper that features pets. You can also include your dog in your wedding photos before or after the ceremony or in your engagement photos. Determine your dog’s role in the festivities. Part of the decision about what role your dog will play in the big day is determining if your dog’s involvement is appropriate for the kind of ceremony you want to have. It probably wouldn’t be appropriate to have your pooch at a church service in which full mass is celebrated or at a black-tie ceremony at an upscale hotel. But outdoor weddings at country estates, farmhouses or mountain retreats certainly lend themselves to canine participation. Consider members of your wedding party, caterers and guests. Not everyone feels about dogs the way you and your fiancé do. (What? Who doesn’t love dogs?) Some guests may not be comfortable around dogs, while others may afraid of them. Still other guests or members of the wedding party may be allergic to dogs. You’ll want to give them ample warning so they can plan accordingly. Also inform your officiant if you’re having your canine companion participate in the ceremony. Some officiants may refuse to preside over wedding vows that includes pets, while others may be willing to hold your small dog. Don’t wait until it’s time to walk down the aisle to find out whether you should have asked someone else to officiate. Finally, let your photographer know — especially if you want unplanned moments with your pet captured. A trip to the groomer will be in order so your furry friend looks and smells good on the big day. And if you’re planning to accessorize your dog, make sure the clothing fits properly and doesn’t cause discomfort. Consider keeping accessories simple, like a bowtie or flower attached to a snazzy new collar and matching leash. Make sure that the flowers or plants used at your wedding aren’t toxic to dogs. Hire a trusted pet sitter to care for your dog on the big day. 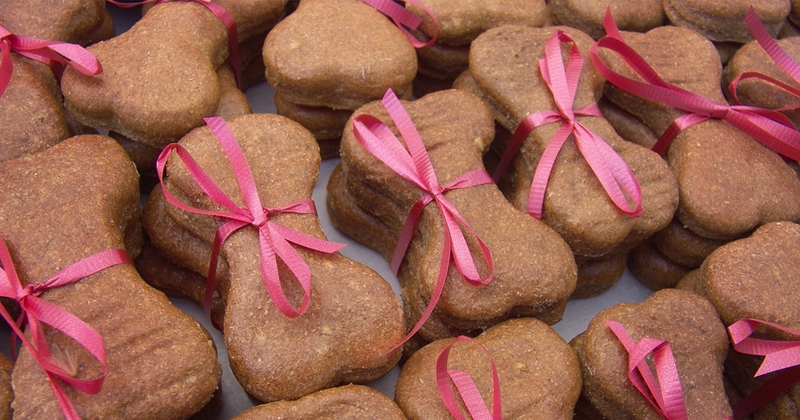 You’ll have enough to worry about on your wedding day, and wondering who’s feeding what to your dog (Chocolate, anyone?) shouldn’t be one of them. Hire a pet sitter, preferably someone your dog knows, to care for your dog. Those responsibilities can include bringing your pet to the ceremony, staying with your dog at all times, feeding and watering, taking your pet home afterward, or supervising the dog during the reception. You’ll want to make arrangements for a quiet place for your dog as well so he or she can eat, drink and rest away from guests and loud noises. Be flexible. Dogs know nothing about wedding etiquette. 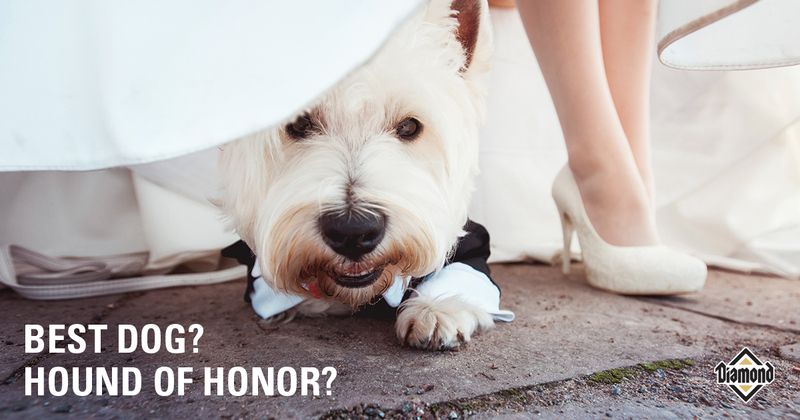 There’s no guarantee that your dog will behave exactly how you want them to on the day of the wedding. Be prepared to go with the flow. But if anything less than a picture-perfect storybook wedding is your goal, reconsider having your dog as part of your wedding party. You’ll avoid unnecessary stress for yourself and those around you.